ARCS is an authorized dealer for CAPATCH. 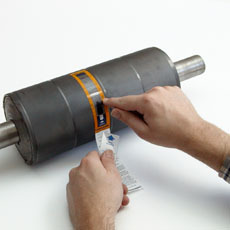 We import this product from Europe and supply it to many converters, printers, roll and ink reps, and others who have a need to quickly measure roll volumes. Capatch works great, is easy to use, and provides invaluable data that can help improve a company’s maintenance program, identify inefficient operators, and help diagnose a quality issue. CAPATCH is a “cell pollution trend watcher” and an instant method for measuring volumes of Anilox, Gravure, Coating, and Tri-helical rolls in printing presses. CAPATCH has a tolerance of plus or minus 10 percent. Although it might have a similar tolerance to other measurement instruments such as Wyco, Urmi, Ravol and Volugraph, it is not meant to replace them. These methods take 10 to 15 minutes, or longer, to carry out. 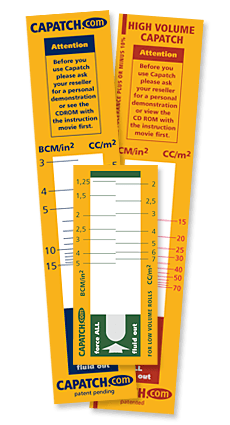 CAPATCH is an additional tool for use in the printing press and gives a rapid reading but with a slightly larger tolerance. 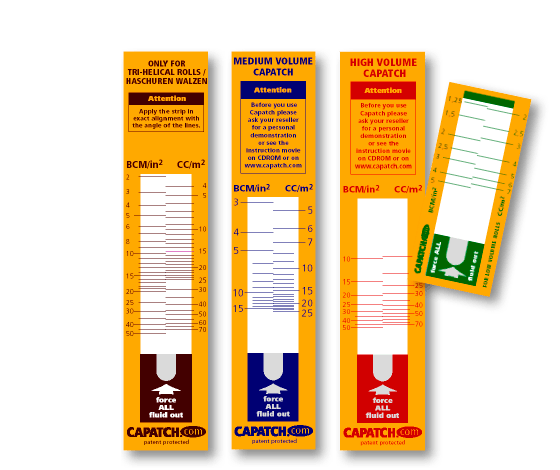 It takes no more than one minute to apply CAPATCH correctly and read the results. This depends on the type of production: frequent changes of production and colors increase the likelihood that the cells will become plugged. Some printers check their rolls with Capatch every week. On each roll they use at least two Capatch strips (usually one in the center and one on either end). 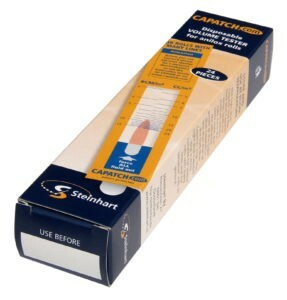 In case of a large difference between the two results, they use a third Capatch strip for confirmation. Please click below for step-by-step instructions and to watch short instructional videos on how to use CAPATCH. We accept orders via phone, fax, or email. Due to new credit card regulations, we can only accept credit information over the phone. We accept all major credit cards.